This is all about the Walther PPS slim compact pistol, chambered for the 9x19mm cartridge. This is one of my favorite newer weapons and one I have owned for four years now. I decided to do this post after an individual claimed that the Smith & Wesson imported PPSs are not all German. While trying to disprove his claim, I discovered a lot of half-truths and vague statements surrounding this handgun online. I also have an e-mail dialogue with Earl over at CarlWalther.com on the subject of where the PPS pistols are made. Lets just shamelessly rip some text off wikipedia to begin with. You can find errors there but for the most part the site gets the general and basic points right when it comes to firearms. Here is the link to the Wikipedia article. Sights Interchangeable 3-dot iron sights"
The article goes on to state that the PPS is about the same size as Walther's classic PPK design. Even though the PPS is chambered for a full power cartridge, this is surprisingly not far off the mark. The PPS is a bit taller than the PPK and a hair longer, but is actually slimmer, especially in the grip area. The PPS was introduced in Germany, in 2007 and the 9mm was first seen in the USA towards the end of that same year. The .40 cal version appeared some time later, about six months to a year depending on location. That said, the PPS was designed from the very beginning to chamber either round with just minor parts differences in the barrel, slide, recoil spring, and magazines. "In the United States, the PPS is imported exclusively by Smith and Wesson, using pistols made manufactured by the Walther facilities in Ulm, Germany. The PPS pistols are also made under license in Poland by Fabryka Broni Radom." Some have questioned rather or not S&W marked PPSs are 100% German or not. Later, we will come to a definitive answer. Back to the gun though, its quite a neat little gun. Its small but does have a bit of weight. This is because the polymer frame is reinforced with a steel internal frame work and the slide rides on full metal rails - not partial metal or polymer rails. The slide itself is also made of all steel, including the sights, so its a bit heavier, but also durable. The pistol is striker fired with a partially charged trigger/striker. The PPS uses the now very standard Browning style of locked breech operating system where in the chamber is enlarged and acts as one massive lug: i.e. like Walther's earlier P99 series or a Glock. A dual recoil spring arrangement is used which both lessens felt recoil and helps improve accuracy. Trigger is similar to a Glock's with the small safety bar in the middle, but it breaks a bit differently. Sights are dovetailed and adjustable and easily removed/replaced if desired. The magazine release is located under the trigger guard and is the standard German style. Many Americans find this style unusual or awkward, but in a CCW piece it's an asset. It's basically impossible to dump a magazine with this style of mag release while in a pocket or holster. With say, a SIG, one could accidently jar the weapon from the side, depressing the M1911 style release button. That is little concern with the release style found on the Walther though. Once shooters get accustomed to this style of release, they will find it quite user friendly. Walther makes three different sized magazines for the PPS. The six round magazine is a flush fit and makes the gun very compact. The seven round magazine gives a bit of a finger rest for the shooter and is great for range use or to use when size isn't as big of a concern. The largest sized magazine, the eight rounder, gives the shooter a fullsized grip comparable to the one found on the Walther P99 or the Glock G19. Its actually quite amazing how much the eight round mag changes the feel of the weapon. For the .40 cal. version, the same sized magazines are offered, but hold one less cartridge because of the larger caliber. Finally, the PPS has what Walther/S&W calls the 'Quick Safe' system. As with the P99, the PPS has interchangeable backstraps. Unlike the P99 however, when the backstrap is removed, the weapon is decocked and rendered safe. As soon as a backstrap is reinstalled, its ready to go again. This is the pistol's most controversial feature which we will look at more closely later. The PPS is packaged standard with a large and a small backstrap. Wikipedia mentions a medium strap, but I have never held one myself, so I don't know if they actually exist. Naturally, there is a MIL-STD-1913 (Picatinny) rail located under the barrel: pretty much a mandated feature on any new production handgun it seems. I have now owned two different Walther PPS pistols in 9mm. The first I bought in late 2007, right after their introduction. 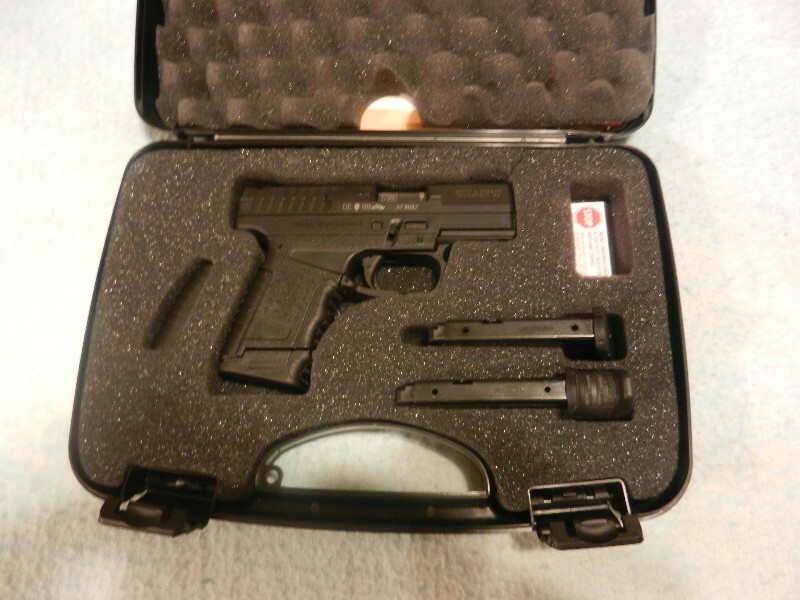 It came with one six round and one seven round magazine and two backstraps in a standard, rounded Walther type case. I had it until recently. It was 100% reliable for me - however, my cousin wanted it so I sold it off to him and kept one of the newer ones I had come in last month. The slide stop on my AH code PPS never gave any troubles and so I never had S&W rework it. The frame is marked with the serial and Walther twice, as well as Made in Germany. The pistol is pictured above with all 3 magazine sizes. Magazine is marked Walther PPS and Made in Italy. This is because MEC-GAR has been producing magazines for Walther under license for a number of years now. It is very common for major manufacturers to outsource their magazines. Both backstraps are also shown with the small one installed on the pistol. The BB datecode just stands for 11 or 2011. Both this new PPS and my old PPS came in the same type of box, however, for a time S&W was shipping PPSs in a different style of box. That style was more like an S&W case and square. I have no idea why they changed, and then changed back, sorry. I do like the Walther rounded box better though as it holds the pistol with the eight round mag inserted better, as well as holding two spare mags easier. I personally have never experienced any problems with either of my PPSs. I find the design thoughtful and easy to both carry and fire. Its about as tall and long as a Glock G26/27 but only 1" thick. The trigger has a relatively crisp and light pull for a defensive weapon. Here is a sampling of online reviews of the pistol to date. "KahrPM vs Walther PPS decision made. best price?" "Ruger LC9 vs Walther PPS"
"Available Upgrades for Walther PPS 9MM." "Walther PPS mag release technique?" I like the German style of magazine release for a CCW, but others extremely used to the M1911 and others find it difficult to adapt to sometimes. As with any firearm, hell as with any mechanical design, faults have been found with the PPS since its introduction. Also people find things they dislike on a more personal level. The biggest design fault was found with the slide stop/release. Basically the spring was not adequately captured and could in some cases slip out and lock the slide release back permanently. Walther has since repaired the design and newer pistols manufactured since 2010 have an upgraded spring and stop. Definitely the best thread online regarding this issue. It has many pages but all you could ever want to know about it is in there. Most pre-2010 pistols still never experienced the failure, but S&W offers a free factory upgrade. Newer PPSs have not experienced the failure since the new design was implemented. "Buying a Walther PPS 9mm tomorrow - Help - 2010 BA or 2011 BB ?." Another guy asking about the slide stop issue. As I said earlier, the QS backstrap system is without a doubt the most controversial feature of the PPS. Many have correctly pointed out that it is unnecessary and just one more assembly to fail. Actual cases of failure though have been very, very few, if any. The backstrap locks in with a tab, which is then covered by the baseplate of the magazine. On top of that, two teeth on the baseplate go up into the backstrap holding it in place. There is no way for the strap to completely fall off the weapon with a magazine inserted. Still nothing is foolproof. "Warning! Walther PPS' a discussion about the Quick Safe Backstrap failing"
Page one outlines the problem and pages 2 and 3 kind of breakdown into fighting, but on page 4 some very good points are made. I do note that originally the owner says the backstrap fell off, but later he just says it slipped down a bit. I can tell you from my own gun, his is not behaving properly. Please also note his gun was from 2008, so it was an early one. Its possible it was faulty from the factory. No one is perfect, not even Germans. "PPS owners beware! I had a total back strap failure today! " A somewhat less well documented case of a stranger's PPS failing at the range. Still worth reading if you like and they keep a pretty friendly tone. "Walther PPS 9mm questions(back straps etc…) "
Personally, and this is my opinion naturally, I think the backstrap is not an issue. If it fails on a half dozen guns over a four year time span over thousands of examples, that's about par for any other part's rate of failing. It's no more prone to fail than any other part of any other handgun. I agree its not necessary, but it is good PR for Walther. Also it does make the PPS legal to own in more markets, especially in Europe. Its possible that the Quick Safe system gives the PPS enough 'Points' under the '68 Firearms Owner's Act to make it importable in standard configuration, I am not sure. People will continue to argue over this but I agree with one of the posters in the links above. He said in short that you shouldn't let a lock stop you from buying a handgun that you otherwise like and want to own. The chances of the backstrap failing during a defensive situation are so astronomically slim they aren't worth worrying about. It would be great if Walther offered the PPS with or without the QS system, but the pistol was designed for the EU market first and it does give the weapon some appeal and legal validity there at least. I guess what I am trying to say is the QS system means Walther can sell more guns, at least that is their expert opinion. Why else would they have it in their weapon? Anyhow, read the threads and make your own decision. The backstrap on mine has never given a problem and I find it far less annoying than other internal safeties such as a magazine disconnect or an internal keylock. Where is the PPS Really Made? "where was my PPS manufactured"
A short and basic post regarding where the PPS is manufactured. A little more in-depth information but still some speculation and conjecture. There is no real possible definitive answer to the backstrap question, but at least this one I can answer satisfactorily. According to Earl at carlwalther.com, in an email conversation I had with him about the PPS, all PPS pistols are 100% manufactured in Germany. This coincides with what S&W also says (the exception being the magazines that are contracted out to Italy). They both use exactly the same frames, barrels, recoil springs, and magazines. Both have steel slides but for some reason they seem to use different types of actual steel. No explanation has been given by either Earl or S&W and Earl is not 100% on the exact steel used in the US PPS version. He is clear though that the slide is still made in Germany. He stated that the US version has a heavier trigger. Perhaps this was done for legal reasons on S&W's part? I know they do a Massachusetts version with a 10 lb trigger to comply with that state's laws. The trigger on my PPS is at about 5.5-6.0 lbs after a bit of break-in. If anyone out there has an Earl's/International version and could provide the pull weight of its trigger, I would be very appreciative. In any case, trigger jobs can be performed on the US version. I do know that the first generation of S&W imported PPSs did have grittier feeling triggers when compared to more recent ones. So its possible they have tweaked the trigger assembly on the S&W imports a bit since 2007-2008. As for the P99s imported by S&W having US made slides and barrels, that appears to be true for some of them, mostly some in .40 caliber. I just checked my P99AS and my P99c QA and both have the standard Ulm proof marks on the barrel and slide as well as German date codes. With the SW99 series, the frames were German and slides and barrels were US. With P99s, you need to check. Some were made with all German parts and others with S&W parts. This wasn't done as a trick or anything. Its just that there was a higher demand for the P99 in .40 cal than expected so to speed up production S&W started manufacturing some parts. In any case, All PPS pistols are manufactured in Germany, end of story. I am grateful to Earl for his friendly and quick service. He is a knowledgeable and helpful man. I like the PPS. I make no claim otherwise. That said I have tried to be fair about the weapon and to give rational reasons for why I feel the way I do. Oh and just to say it here, I also like the P99 and the new PPQ. I've owned a polymer framed Walther of one kind or another for over 10 years now and have still yet to experience any kind of failure. I could say the same for various Glocks I've had or fired, but I just like how Walthers fit my hand more. Personal taste and all that.